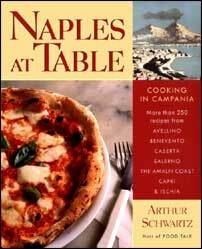 This recipe has been reproduced with the kind permission of Arthur Schwartz and comes from his book Naples At Table: Cooking In Campania. For more than 30 years, Arthur Schwartz, was a newspaper food editor, columnist and restaurant critic. For nearly 13 years, he was the host of the nationally syndicated "Food Talk," the first and still most commercially successful radio food program in the US. He is the author of six cookbooks, including the best-selling "Naples At Table: Cooking in Campania," considered a definitive work even by Neapolitans, and the award-winning "Arthur Schwartz's New York City Food: An opinionated history with legendary recipes." He lectures extensively at museums, libraries, and for benefit and community audiences. He teaches cooking at many venues in metropolitan New York City, and, for the last five years, at his own cooking school, Cook at Seliano, in Paestum, based at Baronessa Cecilia's two neighboring farms, Tenuta Seliano and Masseria Eliseo - onderful cooking vacations in Campania! Cook at Seliano takes place in Campani which is the region in which the famed Amalfi Coast is located. If the idea of taking a cooking vacation and cooking tour with Arthur appeals to you then to find out more click here. Cacciatore, which in Campania is a strikingly simple dish of chicken braised in tomato sauce, is the most popular way of cooking chicken in the region and, strangely, in a place where no one agrees on anything, just about everyone uses rosemary as the herb and onion, not garlic, in the sauce. In a 10 to 12 inch saute pan with cover, heat the oil over medium-high heat and when it is hot, brown the chicken on the skin side first, then the underside. Do not crowd the pan. Brown the chicken in batches if necessary, setting aside the browned chicken on a plate until the rest is done. When the last few pieces of chicken are almost browned and still in the pan, add the onion and rosemary sprigs (or dried rosemary) and saute until the onion is tender. Arrange all the browned chicken in the pan, skin side up, and add the white wine. Season with salt and hot red pepper flakes, then let the wine cook until it has almost entirely evaporated, just a couple of minutes. While it is reducing, turn the chicken in the liquid once or twice, but leave it skin side up at the end. Add the tomatoes. Cover the pan, lower the heat, and let cook at a gentle simmer, without turning, for about 30 minutes, or until the chicken is done. Remove the chicken to a serving platter, increase the heat to high and let the sauce reduce for about 2 minutes. In the end, the sauce will be a creamy pink (rosé, Neapolitans say). Pour the sauce over the chicken and serve immediately. In her 1971 cookbook, In The Kitchen With Love, Sophia Loren says that it is sweet red peppers that make chicken cacciatore really Neapolitan, although no Neapolitan I have asked - culinary experts, cooks, life-long residents of the city - seem to agree. "Well, of course, Sophia Loren is from Pozzuoli," they say, as if that was a foreign or far-off town while it is actually adjacent to Naples. When driving along the sea road, you can't even tell where one ends and the other begins. Truly Neapolitan or not, Loren's version is, however, particularly delicious. Follow the directions for classic Pollo alla Cacciatore, but leave out the rosemary and add, with the onion, 1 medium to large sweet red pepper, seeded, cut into strips no wider than 1/2 inch and no longer than 3 inches. Just before removing the chicken from the heat (or when the sauce becomes reduced to taste), add about 1/3 cup torn or cut basil. Stir well and simmer a few seconds before removing from the heat.